VIETNAMESE MEDIC ULTRASOUND: CASE 137: APPENDIX TUMOR, Dr PHAN THANH HẢI , Dr LÝ VĂN PHÁI, Dr NGUYỄN THIỆN HÙNG, MEDIC MEDICAL CENTER, HCMC, VIETNAM. CASE 137: APPENDIX TUMOR, Dr PHAN THANH HẢI , Dr LÝ VĂN PHÁI, Dr NGUYỄN THIỆN HÙNG, MEDIC MEDICAL CENTER, HCMC, VIETNAM. Man 25 year-old was in pain at RLQ for 3 days. In abdominal ultrasound scans with curve probe 3.5 MHz (image 1), a cross-sectional view disclosed a big appendix in black border and its central part in white spot like bull-eye. Image 2 in longitudinal section, the appendix was like a finger, noncompressible with white line in its center looks like an ascaris inside appendix. Ultrasound with linear probe 12 MHz, (image 3: cross-sectional scanning) showed many rings in the center. Image 4, longitudinal section: the appendix with black content like mucocele. But there was no raising of WBC in blood test. 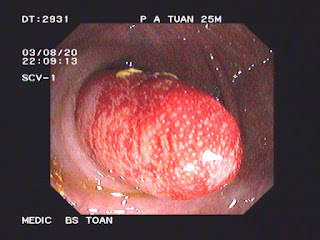 For verifying the appendiceal mucocele, a colonoscopy was done and detected this mass was like a finger covering by mucosa and protruding from appendiceal aperture (see photo). It was hard, not content the mucus after many punctures, so it was thought to be a solid tumor according the report of endoscopist. MDCT without CE also susgested a tumor of appendix (see CT image). Via endoscopic laparoscopy, operation was done but surgeon could not detect any tumor of appendix. Open surgery detected the appendiceal tumor being an intracecal intussusception. And the surgeon removed the tumor after opening of cecum (see photo). Microscopic histology report is chronic inflammation.